My search for interesting cycle-friendly clothing continues. The latest effort is the trousers from Vogue 1378, a Donna Karan design. I could swear I saw these on Net-a-Porter at some point recently, but they’re gone now. The pattern calls for a two-way stretch knit. I used some thin neoprene I got from Cloth House a couple of years ago. It’s not got quite as much stretch as the pattern calls for. From what I’ve read about the pattern sizing the style comes up big and most people have had to go down a couple of sizes. Given my choice of fabric I decided to play it safe and make my usual size in Vogue, which is admittedly already one size smaller than the measurement chart would suggest. When I measured the pattern that gave zero ease at the hip. They have come up pretty slim fitting. The size at the hip worked out fine but the calves are tiny. I had to let them out dramatically below the knee! They also come up long in the leg and short in the waist. I’m 5’10” and didn’t have to lengthen the leg at all, but the waist is a lot lower than the promised one inch below the natural waist. The original design has a long slit at the ankle which gives a slightly flared effect. You can just about see it on the line drawing. I wanted trousers that were tighter fitting at the ankles so I overlapped the two pattern pieces for the lower leg and cut them as one, but kept the decorative top-stitching. If I make these again I’ll use the two separate pattern pieces for the lower leg but sew the slit shut so as to continue the decorative lapped seaming down to the ankle. Here’s a better view of the lapped seams. I posted some details about sewing those last week. Suffice to say this very thin neoprene is easy to mark and sew: chalk markings, a Universal size 90 needle and a longish stitch length work well. Thicker neoprene like the stuff I used for my little black dress is much more temperamental. And here’s a back view. The fabric has drunk all the light again, but yes there are wrinkles. However they’re pretty comfortable to wear and I don’t think I’d want them much tighter. I wore these to work this week. I compensated for the lack of pockets by putting my grey kimono jacket over the top. No one at work batted an eyelid at the fabric…or at least if they did notice they were too polite to say anything! And I can report they’re comfortable and warm to wear, especially on the bike. 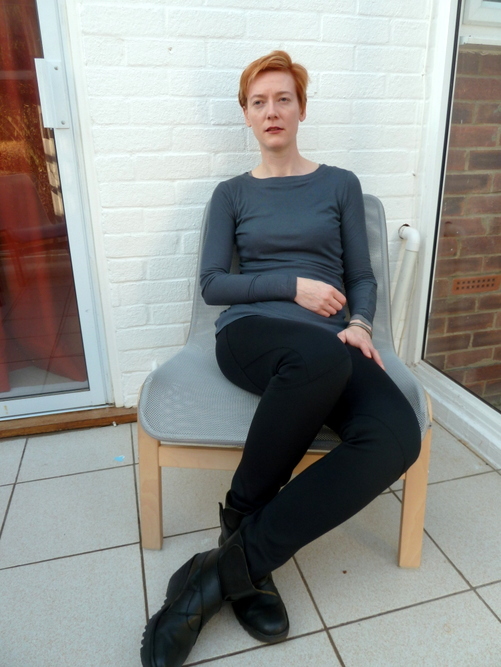 Posted on March 15, 2014 August 5, 2014 by catherinedaze	This entry was posted in dressmaking, Fabric, Finished, sewing, Style, trousers, vogue and tagged dressmaking, neoprene, sewing, trousers, vogue. Bookmark the permalink. Love these! I think these are the most stylish bike-to-work-trousers in the world, especially with all those interesting seams. I’ve never sewn anything with neoprene – sounds like an interesting fabric. These look fantastic. The fabric and pattern seem perfectly matched. The style really suits you too, I certainly couldn’t see altering the width, the wrinkles don’t look like much. Lack of pockets is anoying but you wouldn’t want to spoil the lines of the pants anyway. Odd about the rise given how much leg was provided but these patterns are never consistent. I’ve wanted to try these but shortening the length is daunting especially given how nice they look on long legs. Great trousers! I like this shape – you look really good! fantastic that pattern was made for you! now you have figured out a couple of small adjustments I think you should make them again immediately. I agree with Beth, this looks like a custom pattern designed just for you. You are probably the most stylish woman cycling to work. The fabric, piecing and top stitching add up to a special pair of pants! Very very cool looking. Pattern should be arriving any day now…. These look great on you and it’s a fabulous pattern. It looks like the weather is better too? Excellent review and they look fantastic. I really like these pants and bought the pattern the first sale after its release. Great to hear they are comfortable as well. I would not have considered neoprene originally but it makes perfect sense given the seam details. I am really interested in sewing with neoprene (this is how I found your blog!) . I love the construction of the trousers – they look so comfy, and my be flattering on my pear shape? How edgy! These are the smartest looking cycle friendly trousers I’ve ever seen. I love all the seaming and that you sewed them from neoprene. Awesome pants. I have yet to try neoprene. These trousers look amazing on your lovely long legs and I love the last few tops you’ve done too.